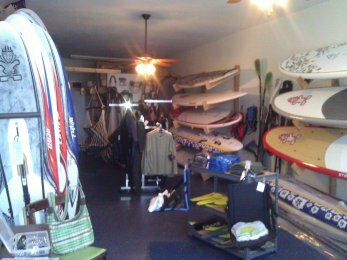 We are the full service windsurfing shop in the St. Petersburg and Tampa Bay area! Whether you need small parts like fins screws or mast base nuts, booties, and wetsuits, or windsurf boards and rigs - we have it in stock and can help you figure out what you need. We are located at 4227 Gulf Blvd. on St. Pete Beach. If you can't make it here in person, check out our online store! Our windsurfing school has programs for beginners to expert windsurfers, kids and adults, thrill seekers and the more timid! More specific information here about lessons, clinics and kids programs. Windsurfing essons are available 7 days a week, by appointment - call us at 727.656.6569 to sign up! If you already know how to windsurf and want to get out on the water while you are on vacation or try out different size boards or sails to figure out what to buy - we can help you out too! Our rental trailer will meet you at one of a variety of locations for the best conditions for your ability and goals and the current wind direction. More information and prices on windsurfing rentals can be found here.